This is EXACTLY what I predicted when this whole Fight for 15! nonsense started. I said be careful what you wish for, because you just might get it and those making minimum wage are about to get it indeed. We heard last month how McDonald’s is bringing automated kiosks to their restaurants across America starting this year. You can choose your language and then you order precisely what you want without the aid of a cashier. Then you pick up your food when it is ready. I can’t wait… it will be an incredible improvement over the current state of things. New York has lost 1,000 restaurants because of this minimum wage crap, as well as de Blasio’s and Cuomo’s taxes and regulations. Both Seattle and New York have been heavily hit by the automation bug and now instead of complaining about a low minimum wage, many of these people will complain from the unemployment line. 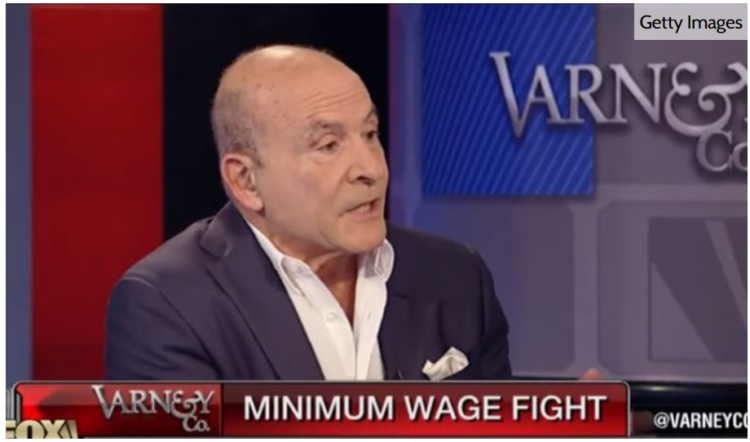 As the CEO of Applebee’s said, you can demand $100 an hour, but if you are out of a job, it’s still $0. Matt recently brought you up to date on how liberals’ minimum wage demands have done severe damage to Seattle’s and New York’s businesses. He highlighted a New York Post report revealing that, in the wake of the increased rate to $15 an hour, New York lost a staggering 1,000 restaurants. Applebee’s was one of the businesses that has been especially hard pressed by the minimum wage hike. Zane Tankel, the CEO of Applebee’s New York franchise, explained that his restaurants were forced to fire at least 1,000 employees so far thanks to the liberal policy. He shared the unfortunate news with Fox Business’s Stuart Varney on Monday. If I understand it correctly, Applebee’s is going to a model where you order their food via a tablet at your table. When it is ready, a runner brings the food out. That means instead of a server for three or four tables, one server will take care of ten tables easily. They will use a concierge model, where a hostess will come to their table just to see if everything is okay and if they need anything. It’s brilliant and will cut down on payroll massively. It will eliminate two-thirds of their labor. If Applebee’s does this, they will be getting rid of 2,000 employees. That’s technological progress for you. People will need to figure out another way to make money, just as they did after the Industrial Revolution. This is the Technological Revolution. “We can’t raise prices anymore,” Applebee’s CEO, Zane Tankel, said, rather candidly, so they had to take drastic measures. This is the fallout over the demand for the hellish increase in the minimum wage. It’s called basic economics and liberals just don’t get it.